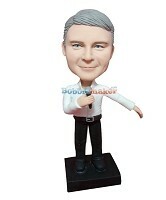 We have an incredibly diverse collection of customization male bobble head dolls. These male bobbleheads cover the gamut. You’ll find sports players of all kinds, you’ll find professional businessmen, and you’ll even find male bobbleheads that have a thirst for life on the beach. No matter what kind of male bobble head doll you’re looking for, you’re sure to find it in our collection. When you add the many options we give you, you have a recipe for the perfect one-of-a-kind gift. Once you’ve selected the male bobblehead you want – maybe it’s a stunning NFL football player bobble head doll? – you can completely customize the bobblehead doll’s appearance. By sending us a photo of your likeness (or another person’s likeness) we can personalize your bobble head doll to be in the likeness of yourself or another person. That’s why these male custom bobbleheads make one of the most unique gift ideas that we can think of, and that’s why they’re perfect for any occasion.